When To Introduce Rice Cereals For Babies? Find If Rice Cereal Is Good? Once a baby is six months old, mother start thinking about introducing solid foods to the baby. There are various options based on grains, fruits and vegetables. Rice cereals are one of the most preferred options. 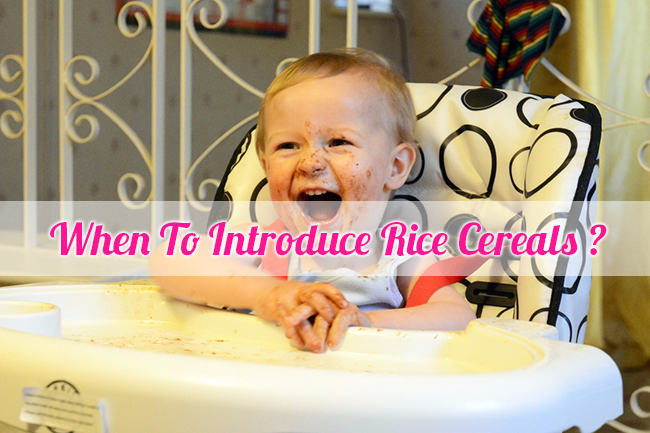 Many mothers wonder when to introduce rice cereals for babies. In this article we will answer when to start feeding a baby rice cereals and how rice is the optimal choice for baby food. Babies are the most adorable beings with their toothless smile and jiber jabber babbles. A baby is new to everything, they observe everything so curiously. Whatever they get goes straight into the mouth chomp! chomp!! They might even open their mouth wide to have a bite of your lunch items. By six months, a baby is able to hold her head up by himself. Around this time, the baby also lose the tongue thrust reflex action which makes him push out solid foods from the mouth. So 6 months of age is the about the right time to start rice cereals for the babies. The babies are grown enough to not choke themselves and now they show keen interest in our food items. However one thing that should not stop before the baby is two years old is your baby's cafeteria - breastfeeding. ​Now "when to start baby on rice cereal?" - there is no hard and fast rule. As mentioned above 6 months is the right time. Apart from this, it also depends on your baby's requirement for energy. Some tend to grow up too rapidly in the earlier months and then slow down. Others might give a shoot to their growth after reaching a certain age and others may follow a gradual slow and steady pace. Children who are hyperactive will need to supplement their feeding formula and breastfeeding with solids . And the deep thinkers, the imaginative ones might have their tummy filled even with the feed you give them. I take this opportunity to urge everyone to celebrate the uniqueness of their child and not stress about rushing through their development! Is ​rice good for babies? ​Your prime aim while planning your baby's diet is to give them the maximum nutrients like vitamins, minerals, proteins, healthy good fat and last is carbohydrates - sugars and fiber. Rice is a perfect combination of all of these. Probably that is why most of the baby formal foods are based in rice. It's very easy to digest. It has lot of minerals lime Magnesium, selenium, iron. It can be made into soft baby foods or given with milk. Always make it a smooth paste not very thick. Rice is usually the first cereal that moms pick for their babies because of its high nutrition and soft texture. Rice is gluten free. Hence, babies who maybe allergic to gluten can eat without any distress. It's very important to note that food with gluten like wheat should not be introduced to the baby at first. But plain rice preparation is not the optimal choice. Rice lacks some essential minerals and nutrients needed by a baby. Therefore baby rice cereals are the best choice of solids. How is rice cereals good for baby? ​Rice cereals have all the inherent goodness of rice plus fortified minerals and nutrients such as Iron and DHA. Packaged rice cereals are formulated scientifically keeping in the mind the requirements for a baby's proper mental and physical growth. ​Rice cereals can be either mixed with mother's milk or water. When mixed with breastmilk, rice cereal becomes a powerhouse of energy and nutrients. Commercial rice cereals are come in different variants mixed with fruits or vegetables and offer a wide range of flavors. ​If your baby is a fussy eater then rice cereals can be very good supplementary food for him. Searching for alternative to rice cereals? Rice cereals are full of protein, minerals and carbs essential for the proper growth of a baby. Find out when to introduce rice cereals for babies.